I happened to be in a Pier 1 store not long ago to pick up some ornaments when I spied a few of their holiday candles on display… there may as well have been a sign above them that yelled “BUY ME” because that’s exactly what I did. No regrets either. Peppermint Crème was too darling not to purchase. 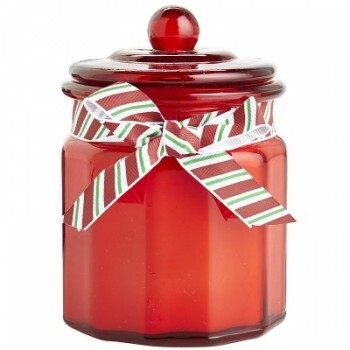 The vessel was Christmas red and shaped like a cookie jar with a matching cookie jar lid… super cute!! And to complete the whole package was a red, white and green striped ribbon tied in a perfect blow around the neck of the jar. So you can purchase this candle for your own personal enjoyment or it also makes a darling gift. Mmmm!!! When I popped off the lid to smell the wax, cool vanilla peppermint hit my nose. Yep… creamy and rich vanilla with the perfect touch of peppermint candy. You’ll want to take bites and nibbles out of this candle!! Because the majority of Pier 1 candles are on the lighter side for me, I decided to burn this candle in a smaller room to start out and ended up leaving it there from start to finish. Once lit, it took minutes to start noticing the fragrance and oh my goodness… it was creamy peppermint magic! The aroma was sweet vanilla cream with swirls of peppermint candy. It was perfect! Strength – on a scale of 1 to 10, I would rate this candle a 7 in a small room. Not bad!! In a medium sized room, I would say 5 to 6 so I’m glad I left it in a smaller room where I could thoroughly enjoy this fragrance. I absolutely loved this candle and plan on buying a few more before Christmas. It’s on sale too which makes it that much more enticing. I love peppermint candy fragrances and Pier 1’s version is near to perfect. 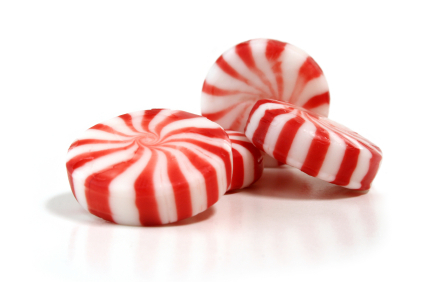 Highly recommend for all peppermint lovers. Have you tried Peppermint Crème from Pier 1 Imports? Review it with us. In the comment section below, review and star rate your experience… it’s easy! Peppermint Cream scent description: The classic holiday treat: Cool, cool peppermint infused with sweet vanilla fragrance. Worth savoring. I purchased this candle but didn't have time to burn it before Christmas ended. Will hold it till winter but it sure smells amazing.